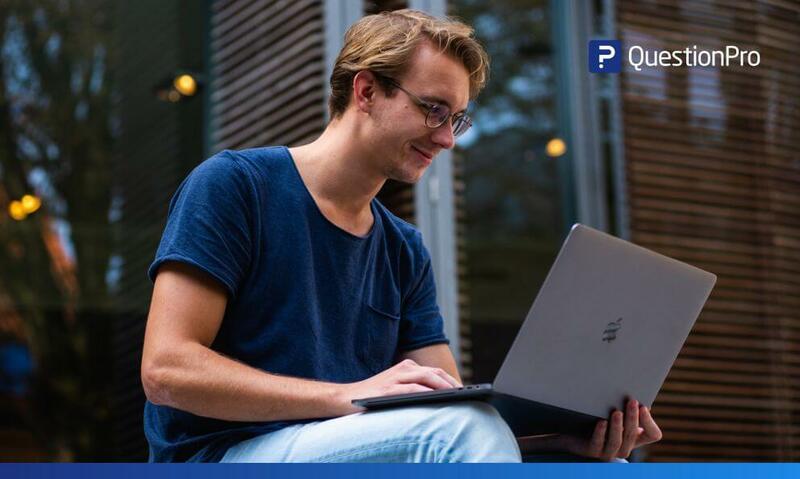 How to create a survey with QuestionPro? 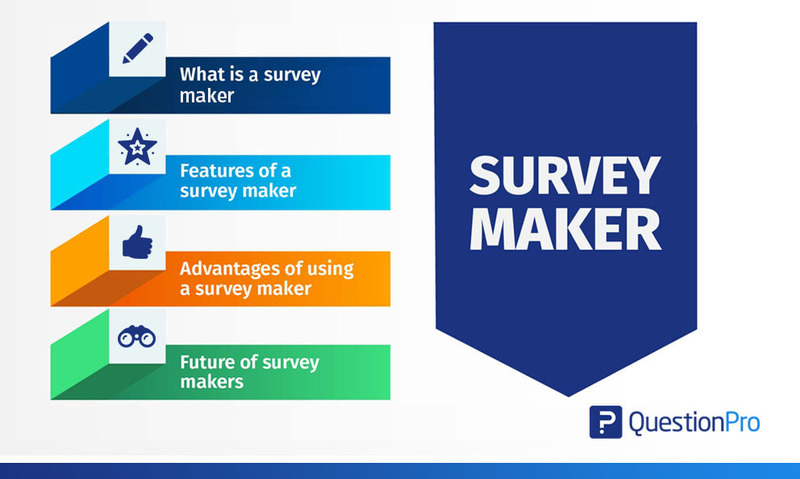 A Survey is defined as a research method used for collecting data from a pre-defined group of respondents to gain information and insights on various topics of interest. Surveys have a variety of purposes and can be carried out in many ways depending on the methodology chosen and the objectives to be achieved. So, what do you need to conduct a survey? First, a sample, also referred to as audience, is needed which should consist of a series of survey respondents data with required demographic characteristics, who can relevantly answer your survey questions and provide the best insights. Better the quality of your survey sample, better will be your response quality and better your insights. A sample is a selection of respondents from a population in such a manner that the sample represents the total population as closely as possible. Determining sample size: Once you have determined your sample, the total number of individuals in that particular sample is the sample size. Selecting a sample size depends on the end objective of your research study. 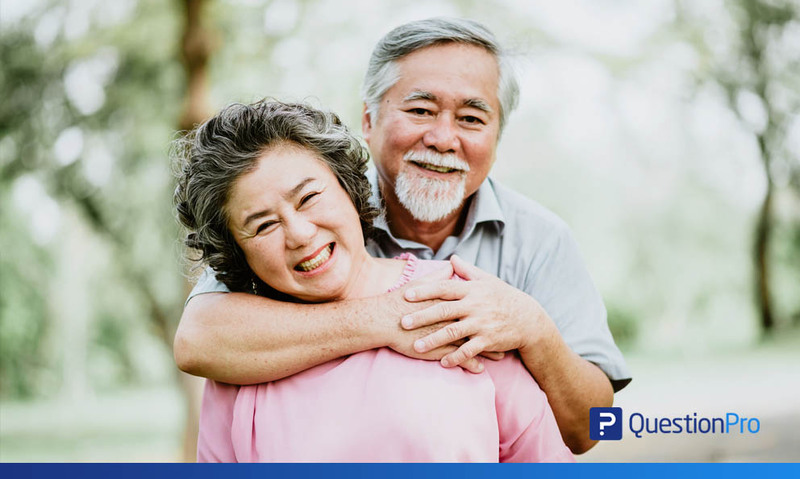 It should consist of a series of survey respondents data with required demographic characteristics, who can relevantly answer your survey questions and provide the best insights. Probability sampling: Probability sampling is a sampling method where the respondent is selected based on the theory of probability. The major characteristic of this method is that each individual in a population has an equal chance of being selected. Non-probability sampling: Non-probability sampling is a sampling method where the researcher selects a sample of respondents purely on the basis of their own discretion or gut. There is no predefined selection method. Effective survey questions are the cornerstone for the success of any survey and subsequently, any research study. Data collection: Whether it an email survey, SMS survey, web intercept survey or a mobile app survey, the single common denominator that determines how effectively you are able to collect accurate and complete survey responses is your survey questions and their types. Fundamental levels of measurement scales: There are four measurement scales which are fundamental to creating a multiple-choice question in a survey. They are, nominal, ordinal, interval and ratio measurement scales without the fundamentals of which, no multiple choice questions can be created. Hence, it is important to understand these levels of measurement to be able to create a robust survey. Use of different question types: Multiple choice questions are the most common type of survey questions, in which, some of the popular question types are: dichotomous question, semantic differential scale question, rank order questions and rating scale questions. Open ended questions are used to collect in-depth qualitative data. Administering the survey: To conduct a survey, it is important to plan the type of survey to ensure you get the optimum number of responses required for your survey. It could be a mix of interviews and survey questions or a questionnaire. Interviews could be telephone interviews, face-to-face interviews, online interviews and questionnaires can be mall surveys or web surveys. The underlying difference between a survey and a questionnaire is that a questionnaire may or may not be delivered in the form of a survey, but a survey always consists of a questionnaire. Survey design: In the survey design phase, the logic has to be developed in a way that redundant questions to each respondent, don’t show up as part of the survey. Application of survey logic: Survey logic can be applied by using conditional branching or unconditional branching. Other parameters such that form the basis of a survey logic depending on the objective of the survey, are, piping data, question randomization, link quota etc. Correlational studies: Correlational study is a non-experimental type of research design where two distinct variables are studied and a statistical analysis is run to study relation between them without the interference of external “variables”. This study aims to understand the change and level of change in one of the two variables in study, if the other variable changes. It is close to impossible to understand in this research method though, that, the cause of change in either variable. For example, if an ice-cream truck has a jingle that can be loudly heard, people start understanding which ice-cream truck is in the neighborhood and how far it is from the location of the person in question. Email: Sending out an email is the easiest way of conducting a survey. The respondents are targeted and there is higher chance of response due to the the respondents already knowing about your brand. 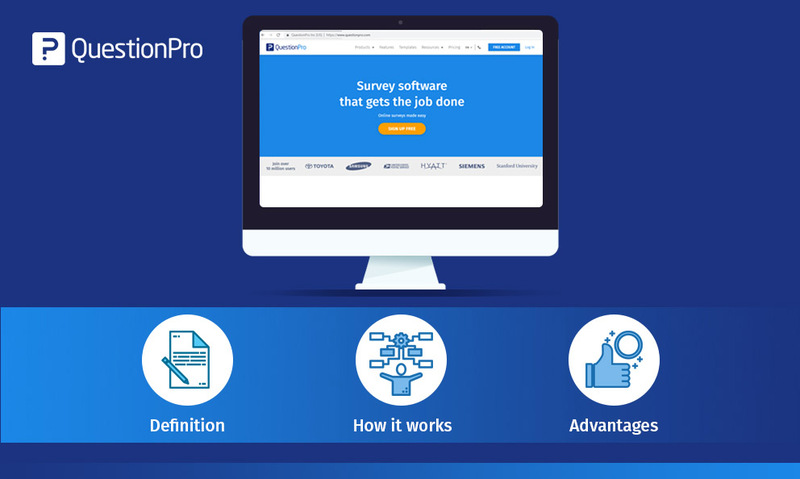 You can use the QuestionPro email management feature to send out and collect survey responses. API: You can use the API integration of the QuestionPro platform for potential respondents to take your survey. In the same way you can use some sample survey question ; ask for the classification of different alternatives. You can do a very short survey, with some questions that can take five minutes or less to answer, or it can be a very long survey that requires one hour or more of the time of the interviewee. For example, Those who need to know in depth behavior or attitudes of people, prefer to use, in addition to surveys a panel or an online community. The methods used to collect survey data have evolved with time. Researchers have increasingly moved away from paper surveys to using smart, online surveys. Each survey data collection method has it’s pros and cons and the researcher has to in most cases, use different methods to collect the requisite data from a sample. The survey response rates of each of these methods varies as multiple factors like time, interest, incentive etc. play a role in the data collection process. Online surveys: Online surveys have now become the most widely used survey data collection method. This method is now widely being used because the reach of the surveys has increased to wherever there is internet access, which is everywhere. There is no limit to the types of questions that can be asked in online surveys and the data collection and data analysis is now structured and easy to manage. The survey response rate of online surveys is very high compared to other survey mediums. Telephone surveys: Telephone surveys are a cheaper method than face-to-face surveys and less-time consuming too. Contacting respondents via the telephonic medium requires less effort and manpower but the survey response rate could be debated as respondents aren’t very trusting to give out information on call. In this survey data collection method, the researcher also has less scope to digress from the survey flow. Face-to-face surveys: Face-to-face surveys are on the most widely used methods of survey data collection. The survey response rate in this survey data collection method is always higher because the respondent trusts the researcher since it is in-person. The survey design in this research method is planned well in advance but there is so scope to digress to collect in-depth data. Paper surveys: The least used survey data collection method that is now being used mostly in field research, are paper surveys. Since they are logistically tough to manage and tough to analyze, researchers and organizations are moving away from using this method. These surveys can be used where laptops, computers and tablets cannot go and hence they use the age old method of data collection; pen and paper. When you conduct a survey, you must have access to its analytics. 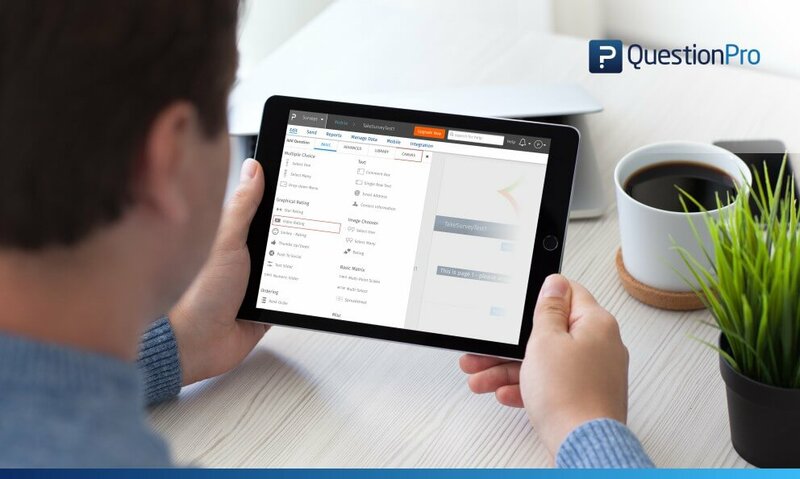 While manual surveys based on pen and paper or excel sheets require additional man-power to be analysed by experienced data analysts, it becomes much simpler when using an online survey platform. Cross-tabulation: Cross-tabulation is one of the simplest statistical analysis tool that uses a basic tabulation framework to make sense of data. Raw survey data can be daunting but structuring that data into a table helps draw parallels between different research parameters. It involves data that is mutually exclusive to each other. Trend analysis: Trend analysis provides the ability to look at survey-data over a long period of time. This method of statistical analysis of survey data helps plot aggregated response data over time which can be used to draw conclusions about the change in respondent perception over time. MaxDiff analysis: The MaxDiff analysis method is used to understand customer preferences across multiple parameters. For example, a product’s pricing, features, marketing etc. become the basis for maxdiff analysis. In a simplistic form, this method is also called the “best-worst” method. This method is similar to conjoint analysis but is much easier to implement. Conjoint analysis: Conjoint analysis is an advanced statistical research method that aims to understand the choices a person makes in selecting a product or service. This method offers in-depth insights into what is important to a customer and what parameters sway their purchasing decisions. TURF analysis: TURF analysis or Total Unduplicated Reach and Frequency Analysis, is a statistical research methodology that assesses the total market reach of a product or service or a mix of both. This method is widely used by organizations to understand at what frequency is their messaging reaching the audience and if that needs tweaking. TURF Analysis is widely used to formulate and measure the success of go-to-market strategies. Customer Satisfaction (CSAT) + Net Promoter Score (NPS) Survey: We hear this time and again that customer is king; and it is true. A satisfied customer is a customer that helps your brand and organization grow, through direct means as well as being an advocate for your brand. This survey template talks about the goodwill your brand has created and how referenceable it is. Company Communications Evaluation Survey Template: This survey example is usually used to analyze employee perspective about what is important to be communicated regularly, topics that should be included in the newsletter, updates on the bulletin board, the efficiency of an organization’s management in communication etc. Hardware Product Evaluation Survey Template: Improving hardware product features isn’t a very easy proposition due to a lot of elements like raw materials, supply chain and manufacturing lines getting affected by it. Hence, while eliciting feedback for hardware, it is important to be as objective as possible. This survey helps understand exactly what product innovation is required. Strategic Planning Survey: Innovation is important to any organization’s product or service lines. Hence, implementing customer support and making product or service tweaks when required are extremely important for the sustenance and growth of an organization. This survey template helps organizations chalk out their business strategy. Business Demographic Survey: This survey template is designed to carry demographic questions and examples that help gain information on occupation, primary area of business, job function and description, organization’s gross income etc. 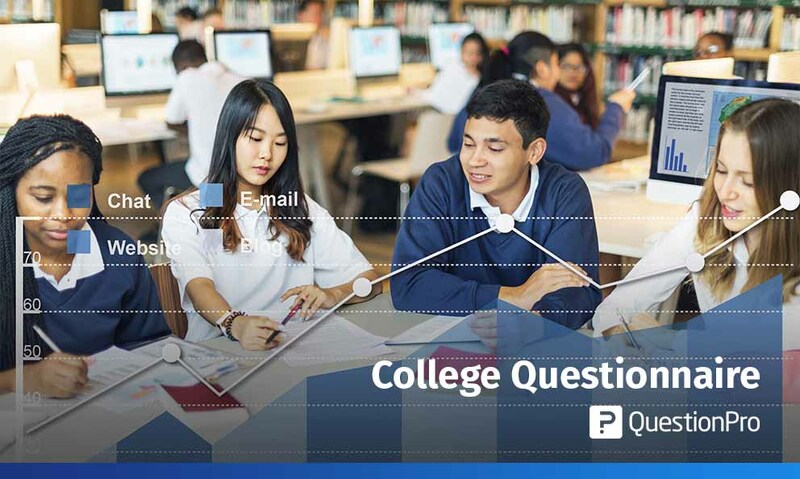 Course Evaluation Survey: This survey template helps educational institutions conduct period feedback on their course and if students find it helpful or not, if it’s stimulating enough and students see this is as value for money along with accentuated learning. Define objective: The survey would have no meaning if the objective and the end result was not planned before administering the survey. The methodology has to be planned for and broken down into actionable milestones as well as the sample planned for. Appropriate survey distribution methods for these samples also have to be put in place right at the outset. Number of questions: The number of questions used in a market research study are dependent on the end objective of the research. It is important to note, not to ask redundant questions or questions where the answers are already known. The length of the survey has to be dictated only by the core data metrics that have to be collected. Simple language: One factor that can cause a high survey dropout rate is if complex language is used in a survey or if the respondent finds the language uncomfortable to understand. Therefore, it is imperative to use easily understandable text in the survey. 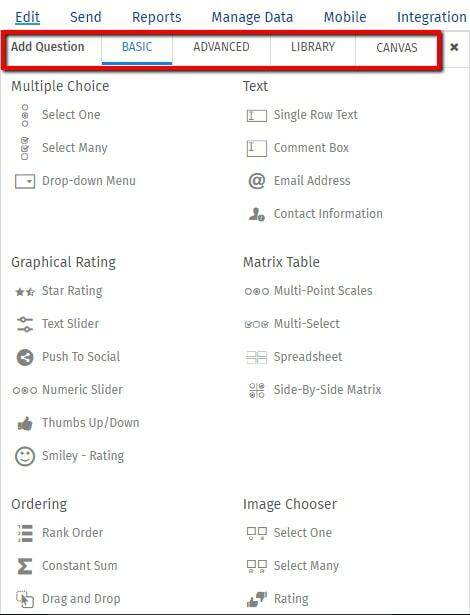 Question types: Multiple types of questions can be used in a survey. It is important to use the question types that offer most value to the research whilst being the easiest to understand and answer to a respondent. Using close-ended questions like the Net Promoter Score (NPS) questions or multiple-choice questions help increase the survey response rate. Consistent scales: If you use rating scale questions, make sure that the scales are consistent throughout the survey. Using scales from -5 to +5 in one question and -3 to +3 in another question may confuse a respondent. Survey logic: Survey logic is one of the most important aspects of the survey design. If the logic is flawed, respondents are put off from continuing with the survey. Logic has to be applied and tested to ensure that on selecting an option, only the next logical question shows up. 2. Once you have logged in to your account from the top scroll bar, choose “Survey” from the drop down box in the top left corner. 3. 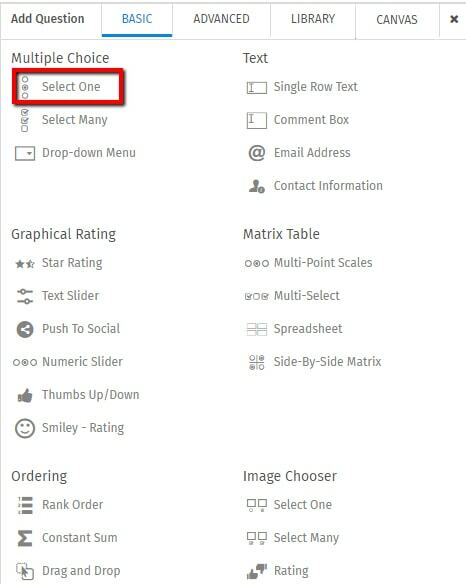 Once you select surveys, you can either start making your survey from scratch or choose from already existing templates. 4. If you decide to make the survey from scratch, the first step is to name your survey. 5. Once you name the survey, you are now ready to add relevant questions. 6. You can choose from a wide range of basic to advance question types from the selection bar on the left-hand side of the page. For example, if you choose “Select one” from the type of questions you will be able to see the question type is displayed on the screen. You can edit the question that you want to ask the respondents. When you edit the options, you can bulk edit the answers accordingly. 7. Once you have added the questions to your survey you are now ready to deploy the survey to the respondents. You can edit the body of the email text and make it more audience specific before you deploy the survey.